The Maryland Department of Natural Resources Fisheries Service has certified two new state records: a freshwater division white perch and an Atlantic division cobia. On September 5, Jack Latimer of Potomac caught a 79-pound cobia about a mile and a half east of the Ocean City inlet while fishing with Steve Magassy in a 16-foot skiff. “We had been out about five miles east of Ocean City fishing for flounder and were on the way back in when we saw the fish on the surface,” Latimer said. He and Magassy simply used what they had and cast out a couple of bucktail jigs tipped with soft-plastic twister tails. “One of the fish took my lure, and that was about it,” Latimer added. They returned to AKE Marina in Ocean City where DNR fisheries biologist Steve Doctor joined them to confirm the species and the weight. The fish was 60 inches long with a girth of 30 inches. James Stiars and his record white perch. 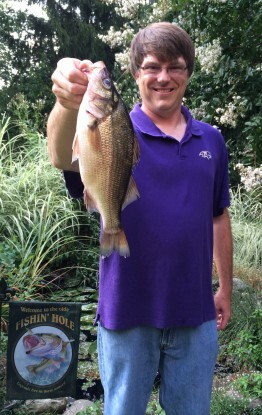 That same day, James Stiars of Baldwin caught a 1.7-pound white perch in the Loch Raven Reservoir, breaking the previous record of 1.62 pounds set by John Williams in 2008 also in Loch Raven. He dropped by the Crab Truck & Seafood Stop in Fallston on his way home to get the fish weighed on a certified scale. The following weekend he met DNR biologist Keith Lockwood at the Maryland Fishing Challenge Finale at Sandy Point State Park to have the species certified, completing the process and earning him this State record. DNR maintains State records for sport fish in three divisions - Atlantic, Chesapeake and freshwater - and awards plaques to anglers who achieve new record catches. To report a potential state record catch, call 443-569-1381 or 410-260-8325. Anglers should keep their fish immersed in ice water to preserve its weight until it can be checked, which can be done at a seafood retailer or a grocery store with a certified scale. Fish caught from privately-owned, fee-fishing waters are not eligible for record consideration. The Maryland State Record application and a list of records are located on the DNR Fisheries website.